HQHosting Review 2019: Is HQHosting a Good Hosting? HQHosting purports to provide high-quality hosting plans, but with no published prices, no supporting documentation, and no customer support response, it’s anyone’s guess if they represent good value. HQHosting (or HQH, meaning “High Quality Hosting”) is an Italian hosting company which since 2007 has been providing web hosting solutions, cloud services, domain registration, internet security, and email services. It has two efficient data centers in Via Caldera, Milan. 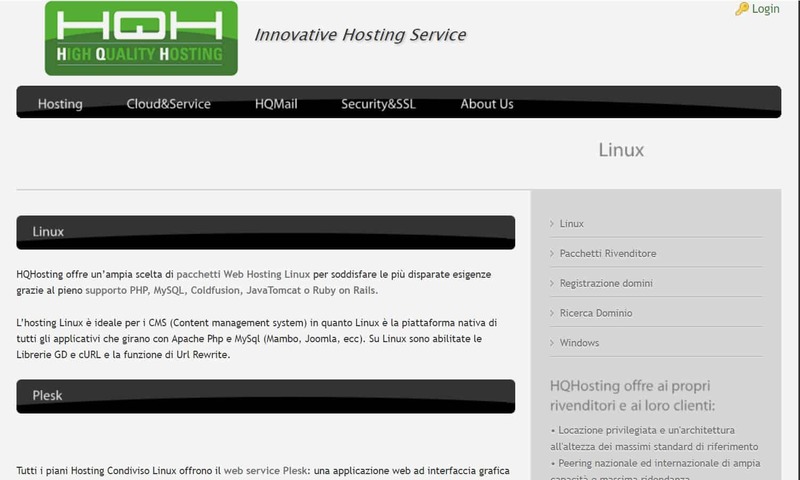 HQHosting’s simple but somewhat poorly designed website in Italian. The Linux shared accounts are a good option for CMS users who need complete common tasks and make content updates quickly. Whether Windows or Linux, all shared hosting plans come with the Plesk control panel that is good enough for installing pre-configured scripts and CMS software such as Joomla, WordPress, Zen Cart, Drupal, and phpBB. You can also easily assign permissions to files and folders as well as managing server logs, FTP accounts, domain email, and DNS. At the other end of the hosting spectrum, HQHosting also offers enterprise-class VPS packages on OpenStack and KVM platforms for more powerful and scalable VPS solutions. And if you own your own server, HQHosting will let you put it in one of its data rooms with guaranteed uninterrupted electricity and a secure and reliable network connection. Unfortunately, HQHosting doesn’t publish any prices or detail any refund policy on its website, so it’s impossible to say if its hosting plans are good value for money or are even still offered at all. There is also no indication of any uptime guarantee. When I sought additional information from customer support, I received no reply for five days… and counting. And I couldn’t resort to self-support because there is no FAQ page or knowledge base. Although HQHosting advertises a range of hosting services on its website, there is no supporting documentation, and I got no response from the customer support team. Get self-styled high quality hosting at an uncertain price from HQHosting! Wondering how HQHosting stacks up against other Web Hosting companies? Enter any other Web Hosting company and we will give you a side-by-side comparison.